I had a hunch about achieving maximum possible logical fragmentation in a SQL Server clustered index based on some work I'd done in a different database engine. Finally decided to put my hunch to the test. I inserted 4084 rows in the table, starting with clustered index key value 4084 and subtracting one along the way, down to one. Why 4084? Cuz this isn't the first time I've done this - or even in the first twelve times, really. :-) I knew it'd come out to 4096 total pages with index pages included. So how does it look? After populating the table, I used the index physical stats function to get fragmentation information. Aha! You can see above that there are 4084 leaf pages, and 4084 fragments in the leaf pages. The average fragment size in pages is 1. It seems maybe populating the ascending key clustered index in reverse order fragmented the table as bad as possible evvaarrr. Merrill Aldrich made a great tool for inspecting physical page placement of small databases. You can download version 1.2 of this tool at the following link. It's a wonderful tool for exploration - but not really suited for large databases in its current form. Let's take a look at details provided from function sys.dm_db_database_page_allocations. So in the graphic above, perhaps more nonintuitively than you'd ever imagined, I show the backward but predictable relationship of the logical order of the pages and their physical order. I'm only showing 2 extents worth of the results, but the pattern continues throughout. How many 64kb extents does test table sq_dashE_1 span? OK. So the 4084 leaf pages are reported by sys.dm_db_index_physical_stats as 4084 fragments of 1 page each. The leaf pages are spread across 513 extents. How many physical reads will it take to do an unordered full scan of the table? Anyone think 4084, one read per fragment? How about 513 - reading an entire 64k extent at a time? Let's see. 87 reads. 33554432 bytes=4096 eight kb pages(4084 leaf pages and index pages). And what about the report from STATISTICS IO? Here's something I mentioned elsewhere - still not gonna support my assertion, just gonna drop it here: disk reads to support database pages by read-ahead aren't reported by STATISTICS IO, only the number of database pages read by read-ahead. So in this case we've seen 87 disk reads from sys.dm_io_virtual_file_stats and STATISTICS IO is reporting 3. That leaves 84 reads to cover the 4072 pages read by read-ahead. 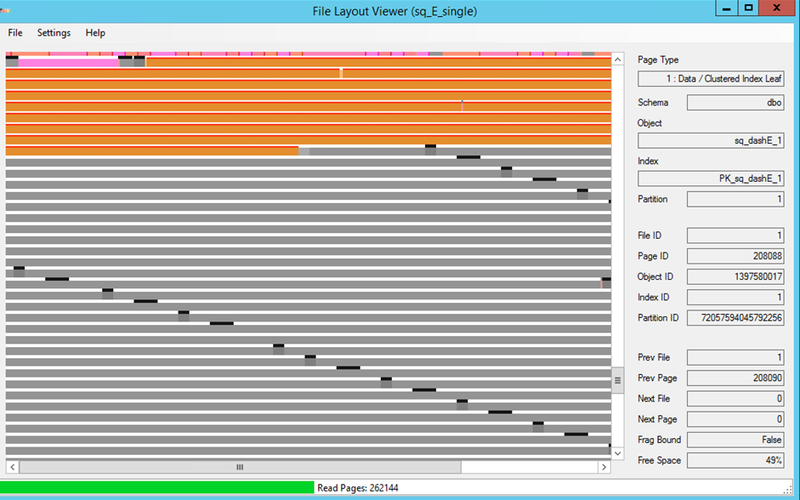 The average read size across all 87 reads was over 370kb - somewhere between 5 and 6 extents by average. And if you read ahead in the series to the 5th post, you'll see a similar table, with a measly reported .0245% fragmentation that requires 338 reads for a similar query!!! So maybe fragmentation isn't all that bad?? But I do plan to show that, depending on goals for index maintenance, index fragmentation evaluation may need to be a lot different than current common methods. OK, done for today. Well... ok, I got one more thing. There are 4096 8k pages in sq_dashE_1. That'd be 512 extents(eight pages each) if perfectly packed. But we know from sys.dm_db_database_page_allocations the pages for sq_dashE_1 span 513 extents. So somewhere there's a blank space. In my recent blog post 'SQL Server Granted/Reserved/Stolen Workspace Memory in Perfmon' I hinted at a twist in the story of perfmon accounting of workspace memory. Here's the stolen/free/database cache account of memory from perfmon on 'system B'. Its a big memory system - a terabyte of RAM. At times more than 250 GB of RAM is stolen memory. Wonder how much of that is used workspace memory? How about inserting an Excel column for the difference between 'SQLServer:Memory Manager\Granted Workspace Memory (KB)' and 'SQLServer:Memory Manager\Reserved Server Memory (KB)'? Whoa... reserved memory should be a subset of granted memory?!? The amount of granted memory is so small I can't even see it on the same scale as the reserved memory. Adjust the scale and I can see that 'SQLServer:Memory Manager\Granted Workspace Memory (KB)' rarely has much memory accounted at all. Well, I know that there are multiple Resource Governor workload groups on this server. Here's a graph of their CPU activity during this observation time. WrkGrp_4 is the main source of activity during the observation period. I wonder how these workgroups are distributed among Resource Governor resource pools? Each resource pool added to the RG results in a new set of memory brokers added to the system, including a new memory broker to account for memory grants within the pool. Sure - I could show the RG configuration but I'm a charts-n-graphs kinda guy :-) Comparing this graph of Resource Pool CPU utilization to the previous graph, its clear each of the 4 workload groups is associated with its own resource pool. With additional resource pools and their brokers in the mix, the accounting of 'SQLServer:Memory Manager\Granted Workspace Memory (KB)' and 'SQLServer:Memory Manager\Reserved Server Memory (KB)' is expected to change. We can see that 'SQLServer:Memory Manager\Granted Workspace Memory (KB)' only reports the granted query memory for the default resource pool. With that being the case, consistency would predict that 'SQLServer:Memory Manager\Reserved Server Memory (KB)' only report the unused portion of memory grants within the default resource pool. If that were the case, 'SQLServer:Memory Manager\Reserved Server Memory (KB)' values would always be less than 'SQLServer:Memory Manager\Granted Workspace Memory (KB)' - we've already seen that's not the case. Below is a transparent red overlay of 'SQLServer:Memory Manager\Reserved Server Memory (KB)' on top of a stacked graph of 'Active memory grant amount (KB)' for each of the resource pools. So there's a fundamental difference between perfmon values for 'SQLServer:Memory Manager\Granted Workspace Memory (KB)' and 'SQLServer:Memory Manager\Reserved Server Memory (KB)': the granted memory values are ONLY for the default resource pool, while the reserved memory values are an aggregate across all resource pools. Without that important tidbit, memory accounting can get pretty weird if there are active added resource pools to the Resource Governor configuration. With that piece of knowledge, I add a column to Excel that sums the active memory grant amount for each of the resource pools, then subtract 'SQLServer:Memory Manager\Reserved Server Memory (KB)'. The result is the total stolen/used workspace memory across all resource pools. I wish perfmon had a counter for reserved memory per resource pool to accompany its granted per pool counter. Alas - if you want that you're gonna hafta reap it from sys.dm_exec_query_memory_grants or sys.dm_exec_query_resource_semaphores. Anyway - with my new computed column I can see that stolen/used query memory is that largest contributor to stolen memory during the observation, and based on the counters for granted per pool I know that the vast majority of the used/stolen query memory during the observation was against grants for ResPool_4. 1. Often query concurrency is limited by the amount of granted memory - but used query memory may be a small fraction of granted throughout. If there's CPU to spare, using Resource Governor to limit the maximum query grant size can increase system performance by decreasing resource_semaphore waits and increasing query concurrency. 2. Sorting and hashing activity in workspace memory is not counted in the perfmon 'buffer page lookups' counter. So when there is massive amounts of sorting, it can bend the relationship of CPU utilization to logical IO on the system. Important to know when modeling system behavior. 3. If there are multiple resource pools active at the same time (other than the pre-existing default and internal pools), the system is vulnerable to out-of-memory exceptions when granted workspace memory becomes overcommitted and non-workspace memory steal/allocations fail.